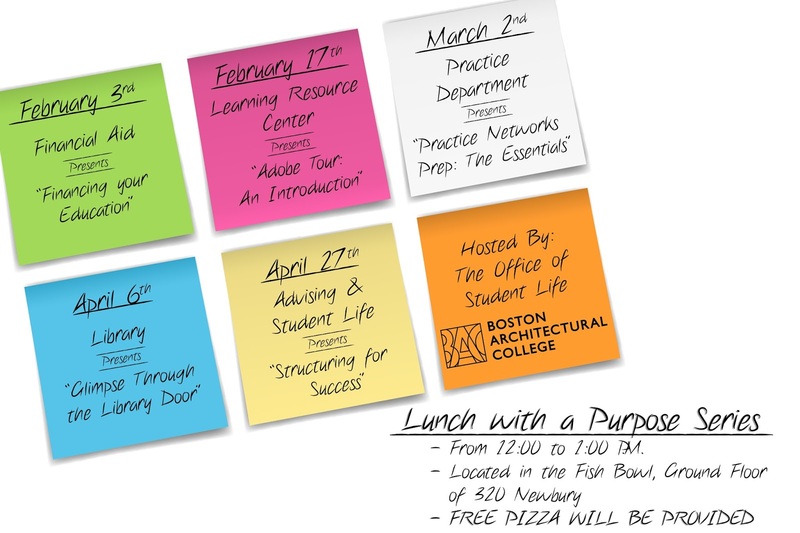 Introducing :: Spring 2016 "Lunch With a Purpose" Series! 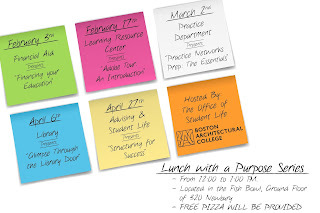 The Lunch with a Purpose series will connect BAC students to various campus departments and resources. Over the course of the semester, students will be able to attend various presentations and workshops led by staff that will enrich their BAC education. Wednesday, 2.3: "Financing Your Education"
PJ Ouma (Financial Aid Counselor) and Sarah Hoen (Student Services Coordinator, Scholarships + Awards) are prepared to answer any questions you have regarding financial aid and supporting yourself at the BAC. BAC students will learn about Federal and State financial aid, Federal student loans, and scholarships and awards available at the BAC! Wednesday, 2.17: "Adobe Tour: An Introduction"
An overview of essential Adobe graphics software for the design student. Featuring: Photoshop, Illustrator, and InDesign. What do they do? When do we use them? What are their most important features? Join Peter Gruhn for a whirlwind tour and lunch! Wednesday, 3.2: "Practice Networks Prep: The Essentials"
Finding your first job or transitioning into your next position is an important step in your professional career. In preparation for our Practice Networks Career Fair on Saturday, do you have your strategy mapped out? Meet with the Practice staff to discuss formal and informational interviews, protocol and strategies for a successful resume, cover letter, and portfolio and learn about appropriate interview etiquette. Wednesday, 4.6: "A Glimpse Through the Library Door"
Join the Library staff for a historical presentation of the Memorial Library! Learn about the Library's history and view the collection of architecture volumes. Look at architecture through the eyes of BAC students of 100 years ago. Wednesday, 4.27: "Structuring for Success"
Join the Office of Advising and Disability Services for a session focused on wellness and stress management. We will discuss strategies and resources AND make stress-relieving crafts!